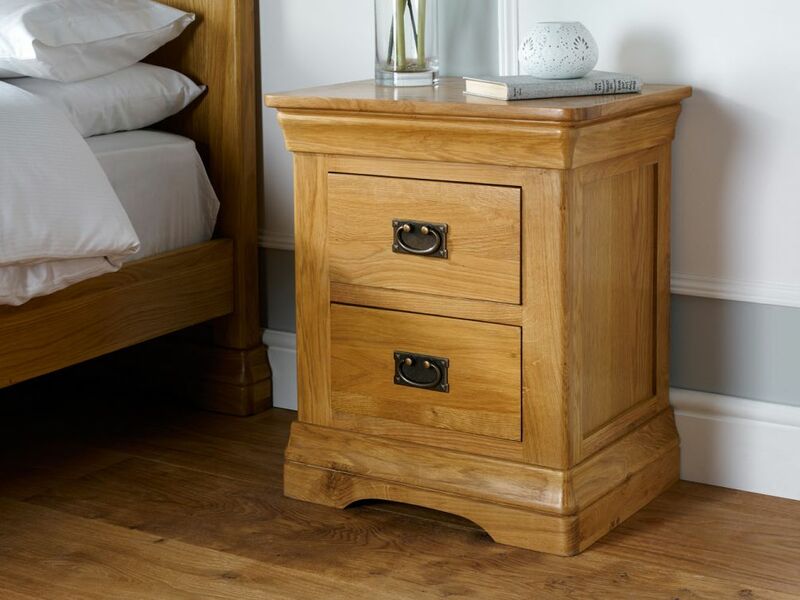 These French Farmhouse style of oak bedside tables are hand made exclusively for Top Furniture in this popular French inspired design. Our skilled joiners only use the finest grade of sustainable American oak to made these bedside tables. 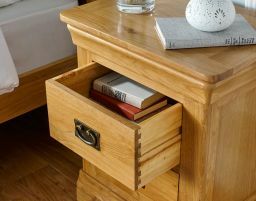 Dovetail joints come and standard for added drawer strength and the gorgeous cuts of premium oak are hand finished with an oiled wax which makes it very durable but it also bring out the character and grain in the oak. Delivered fully assembled ready to use. Dimensions: W 540 x D 395 x H 640 (mm) - Available to view in our Uttoxeter, Staffordshire and Dartford, Kent shops. Lovely solid piece of furniture. Great size for a bedside table, with plenty of space on top for all normal bedside bits and bobs. The drawers are lovely and deep and will be able to hold a lot. Gorgeous finish- highly recommend! Absolutely beautiful and the colour of the oak matches our bed. Good value for money and Top Furniture gave us an excellent service. I bought two of these bedside tables in December and liked them so much I have just bought another two! They are good quality and well made with a nice sturdy feel. Top Furniture arranged a suitable delivery time and kept me informed of progress. I will definitely consider Top Furniture again. Excellent pices of furniture excellent craftsmanship very good price excellent delivery service that’s all I need to say. The bedside tables are a lovely piece of furniture. They’re well built and look really nice. Really good quality and service. Purchased a wardrobe and draws 2 years ago and service is just as good now. Lovely item and well made. Really sturdy, excellent quality and amazing value for money. Good quality bedroom furniture. We purchased these items as a moving in present for our daughter and son in law in their new home and they love the design and style of the furniture. Would buy again from Top furniture based on my experience regarding price, customer service and great looking furniture. 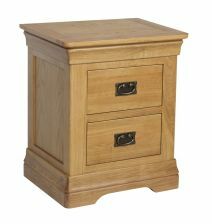 Lovely oak bedside drawers, great value for money and delivery was fab, I was given a two hour window, 9 to 11 and the guy turned up 10 minutes early - good service and good quality furniture will use Top Furniture again. Only downside was the furniture only being delivered just inside the front door, my husband just managed to carry the items upstairs but I would really like a chest of drawers to go with my furniture but I would have to get other people in to take it upstairs for me. Excellent piece of furniture, good quality. Excellent service and well wrapped when delivered. Nice quality item, very pleased, at a great price too. Bought bed plus two bedside tables and a chest of drawers for my spare room. I am delighted with the standard, appearance and quality of all three items. Highly recommend this company. Excellent quality, no assembly and delivered on time. Will definitely buy again. These two cabinets arrived today. The delivery time was within the time stated and I was contacted a few days before to let me know when they would arrive. The cabinets were well packed and in good condition when they arrived already assembled. They are exactly as shown on the website, good quality, attractive and a welcome addition to my bedroom. This is my first purchase from Top Furniture and I will definitely go to them again. Excellent service from order to delivery. Product is of high quality. I definitely recommend Top furniture. Given a delivery date and time, received a call in advance of this to confirm. Well packed and not a scratch in sight. Very easy to put together and feels solid now built. Stunning piece of furniture that looks far more expensive than it actually was. Classic and beautifully made, which adds the wow factor to our newly decorated and furnished bedroom. A real find for our new home, along with all the other wonderful furniture we've recently purchased from Top Furniture. 5 stars. Good quality furniture, well packed for transit, efficient communication about delivery timing, goods arrived exactly on time. Great service, we are happy customers. My Furniture arrived on time. The 2 guys who delivered was very polite and helpful. The furniture is stunning. Well protected . I will be ordering again and recommending to my friends. Large selection of furniture items, we wanted 2 bedside cabinets. Ordering was very easy. We were regularly kept up to date with delivery which was very speedy. The cabinets arrived very well packed and we are totally happy with them and the price was very competitive. Will definitely be using them again soon for a new dining table. 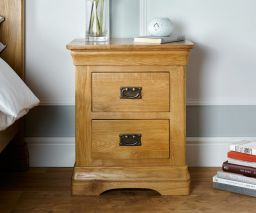 I am very pleased with the oak bedside cabinet, I will be buying more from Top Furniture! Well made from quality oak timber and beautifully finished. Very nice furniture. We are a returning customer to Top Furniture, so pleased with our Bedside Tables, they are excellent quality and finish and arrived quite quickly. Customer service is on point. I know we will be back for more items. Thank you guys!! Absolutely perfect size and beautifully finished a lovely addition to our renovated bedroom. Very happy with the quality of my new furniture. Service was excellant. Very pleased with the quality and service. Delivery arrived several hours earlier than indicated though. Quality item for bargain price, very happy. 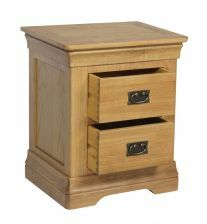 Promptly delivered with good pre-delivery communication and excellently packed, it's a sturdy, well made piece of furniture, the drawers nicely dovetailed, the oak attractively figured in a way which will make it even more characterful as it ages. Delighted in all ways. This a lovely looking piece of furniture.Nice little drawers and nice shape handles.Very happy with the quality and overall look of this piece of furniture.Think the price is fair for the quality in this bedside table.I have had 6 Indiividual pieces of this furniture and still plan to add more so i can say i would recommend this furniture and company to a friend as they definitely live up to the name,TOP QUALITY FURNITURE. //*_*\\, and staff. Excellent quality product, never seen so much packaging and as such Supplied in great condition. Will use again! Very satisfied with quality and value of my recently purchased oak bedside table. I hope to make further purchases. Good quality oak furniture which will last for years. So impressed we bought two dressing tables. Very pleased with service from Staff at Uttoxeter warehouse. First class quality. Very well manufactured. Solid. Look stunning. Excellent value for money. Well packaged. Can't fault them at all. Extremely pleased. The bed side tables were excellent, I was very pleased with them. Will definitely buy from you again. A Hale. 5. pr43ux.